Somebody must have reinstated Paul Krugman's passport. He was recently back in Japan to meet with the world's leading economy-wrecking triumvirate ----Prime Minister Abe, BOJ Governor Kuroda and Finance Minister Taro Aso-----to dispense some desperately needed advice. Japan is on the verge of a second recession during Abe's tenure despite his plunge into full frontal Keynesian stimulus. But since March 2013 when Kuroda cranked up the BOJ's printing press to white heat, two main things have happened. The BOJ's already bloated balance sheet has exploded by 2X and the flat-lining Japanese economy has continued undulating to nowhere. Professor Krugman was naturally at the ready with a solution. He recommended his hosts take a lesson from the America's World War II playbook and declare "the fiscal equivalent of war". That's right. The hoary Keynesian mantra about the fiscal stick save of WWII is a complete myth. What happened is that the US economy was entirely regimented for war mobilization.There were few consumer goods on the shelves and business had no need to borrow for working capital or equipment because financing was supplied by Uncle Sam. So private sector savings soared to nearly 20% of GDP and combined household and business debt dropped from 150% of GDP on the eve of war to 60% by the end. In short, Washington's great war spending binge between 1941 and 1945 did not prove in the slightest that you can borrow your way to prosperity. Federal debt rose temporarily to 125% of GDP for the last year of the war only because bountiful private savings and the wartime liquidation of business and household debt left massive financial headroom to accommodate Federal borrowing. Even then, 80% of the entire wartime cost was funded with emergency taxation, which soared to 40% of GDP and net private savings. The Fed's printing press was used only sparingly. 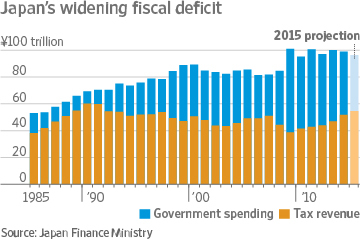 In any event, the Japanese triumvirate needed no history lessons about the fiscal equivalent of war-------even one where they had been on the receiving end of the alleged borrow and spend. They have already accomplished it, having taken their debt ratio to 230% of GDP or virtually double the peak US war level. Moreover, the next chapter is always completely ignored by the Keynesian storytellers. After August 1945, a war-weary nation demanded rapid demobilization of the war machine, causing annual Federal outlays to plummet from $95 billion in 1945 to only $37 billion in fiscal 1947. At the same time, the regime of heavy wartime taxes was only modestly reduced, permitting the Federal budget to swing into surplus---where it remained until the Korean War. In short, the US undertook at massive fiscal swing into surplus within two years of the war's end, and thereby reduced the public debt ratio from 125% of national income to less than 80% by 1950. Oh, yes. Notwithstanding all this fiscal contraction, between the beginning of 1947 and the on-set of the Korean War in June 1950 real GDP expanded by 15%! Needless to say, Japan is pursuing just the opposite game plan. It's fiscal deficit remains wide open, causing its debt ratio to continue to climb into historically uncharted waters. At the same time, the BOJ is destroying Japan's famed savers. Indeed, given Japan’s rapid demographic lunge toward the status of an old age colony, its households should be salting away extra-ordinary amounts of savings, but just the opposite has occurred. By 2015 Japan's household savings rate, which had been nearly 20% in the early 1980s, had hit the zero bound. Needless to say, Japan is a lost cause. It is only a matter of time before the triumvirate of madman running its machinery of state blow its financial system sky-high. Still, it would appear that Professor Krugman's crackpot preaching is never done. As Lakshman Achuthan describes below, he apparently has persuaded Prime Minister Abe to take the fiscal equivalent of war doctrine to the up-coming G-7 meeting in Japan. Say this for Mr. Abe. He can't be accused of failing to lead by example.